The Waste (England and Wales) (Amendment) Regulations 2012 were laid by ministers in July in an attempt to draw a line under the on-going legal wrangle over collection methods. The new amendment stipulates that named recyclable material should be collected separately where necessary and where it is “technically, environmentally and economically practicable”. Defra and the Welsh Government were forced to amend the law when reprocessors and opponents of commingled collections, concerned about recyclate quality, brought a judicial review (JR). The JR was halted in December 2011 after the Government said it would make a fresh attempt at transposing the EU revised waste framework directive (rWFD). While waste management firms and local authorities welcomed the amendment that will effectively allow commingling, opponents have said it is not good enough. Andy Moore, of the Campaign for Real Recycling (CRR) that began the legal challenge last year, said in July the amendment was “still not an adequate transposition of the revised Waste Framework Directive”. 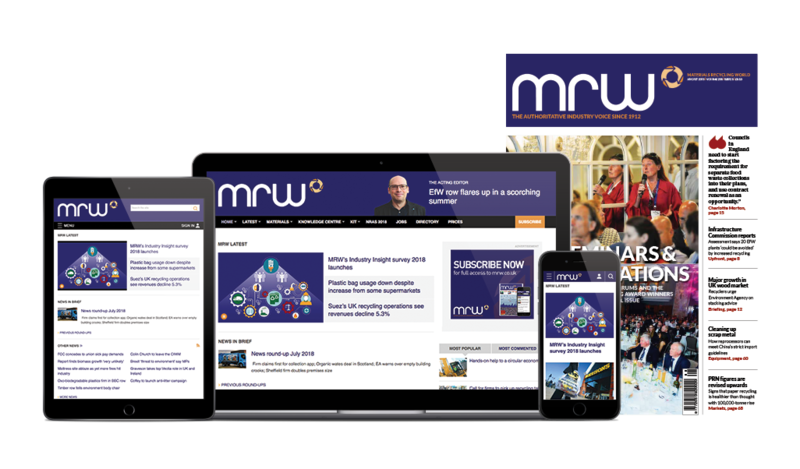 Last week CRR’s solicitor told MRW they had made an application to “progress the existing court proceedings on the basis that the amended regulations still do not comply with European Directive”. Phillip Ward, former government official and WRAP head of local authorities, said he was concerned about the “low level of awareness” among councils and others about the new regulations. Councils letting new contracts would need to show separated collections had been properly evaluated and that conditions for material sorting quality had been set for commingling, said Ward. Defra has again failed to publish a consultation on the MRF code of practice and quality action plan, a vital plank of the governments’ strategy to increase recyclate quality while allowing commingling to continue. The consultation was originally due in August but, as MRW revealed, was delayed until September so it could be bundled with a raft of other Defra measures. The consultation follows months of discussions between interested parties, with opposing groups reluctant to cede ground to the others. A Defra spokeswoman said she was unable to give a date for the consultation luanch at this stage. The amended Regulations relate to the separate collection of waste. They amend the Waste (England and Wales) Regulations 2011 by replacing regulation 13 to separately collect waste paper, metal, plastic and glass from January 2015. It also imposes a duty on waste collection authorities, when making arrangements for the collection of such waste, to ensure that those arrangements are by way of separate collection. These duties apply where separate collection is “necessary” to ensure that waste undergoes recovery operations in accordance with the Directive and to facilitate or improve recovery; and where it is “technically, environmentally and economically practicable”. The duties apply to waste classified as waste from households and waste that is classified as commercial or industrial waste. The amended Regulations also replaced regulation 14(2) to reflect the changes to regulation 13 to ensure a consistent approach. Consequential changes are also made to reflect changes in paragraph numbering in the new regulation 13. The forthcoming review of waste policy will contain a waste prevention plan, the Government’s director of waste at Defra has confirmed. Localism and giving more power to consumers looks to be a key theme of Defra’s waste strategy, following secretary of state Caroline Spelman’s address at the WRAP conference yesterday (9 November).